It is said ‘Failure is just a stepping stone to success’. 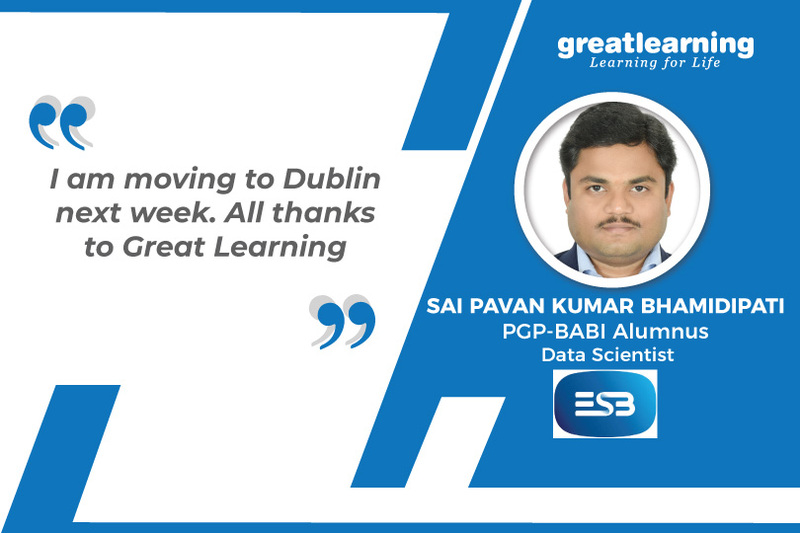 In the case of our alumnus Pavan, his persistent attempts at interviews helped him to hone his skills to perfection. What motivated you to take up this program? I wanted to get into analytics. While working on data warehousing projects at Cognizant, I developed an interest in data science and that’s when I decided to take up a full-time program. I wanted a program which would add value to my resume and my career as well. Why did you choose Great Learning? I went through a lot of reviews before I locked in Great Learning. It is a more flexible and economical option compared to the other courses. How did the program influence your learning journey? I can say that the faculty and the curriculum are the best. The sessions were so interactive and faculty (like RL Shankar) were really good. Video recordings assisted for reference whenever we were struck. Were you able to achieve the career goals you had set before joining this program? After graduating in Feb’18, I tried rigorously for a transition to a full-fledged analytics role. Though most of the job descriptions demanded 3-4 years of real-time experience, I attempted each and every interview to understand the industry expectations. I would like to mention here that whatever we learnt in the Great Learning BABI course met the expectations of the industry. The knowledge gained has given me the confidence to attempt various hackathons conducted at Great Learning and several other platforms as well. Every time I failed, be it at an interview or a hackathon, I was able to analyze the mistakes well. All thanks to the knowledge gained from the program. Without having a good understanding of what we are attempting, one can’t analyze his mistakes & improve. Meanwhile, I was also able to get my hands on some real-time small scale projects in my current organization. After all such attempts, I am happy to share that I was able to crack Data Scientist Interview with ESB Ireland. I am moving to Dublin next week. All thanks to Great Learning again. I would like to thank all the extraordinary faculty of Great Learning for such a great course & sharing their rich experiences which helped me in transitioning to analytics as a career.